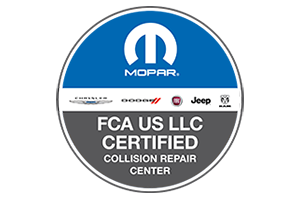 Glaser’s Collision Center is a certified collision center for Fiat Chrysler Automobiles which includes: Dodge, Jeep, Ram, Chrysler, Fiat, SRT and Mopar vehicles. We are trained to use the proper tools and equipment to properly repair your vehicle. We use the most current repair protocols directly made for Chrysler, Dodge, Fiat, Jeep, Ram, SRT and Mopar vehicles. Our highly-skilled technicians are trained through the I-CAR program. We recommend the use of Original Equipment Manufacturer (OEM) parts. We are committed to maintaining the lifetime limited warranty on your vehicle. We encourage our customers provide feedback for their experience during the repair process!